This item is an image. It was created by an unknown creator on or around the date published: 1975. Collectable card album produced by Sanitarium for Weet-Bix cereal packets. Recto: "New Zealand's booming industries. Your Weet-Bix card album". Colour illustration of a wharf and container ship. 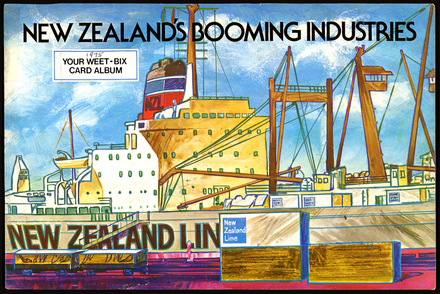 Inside pages: Information and images relating to the various New Zealand industries that formed our economy in the 1970s. Card album is complete.